Palestinian women train for an all-women's baseball game on a soccer field in Khan Younis, southern Gaza Strip, March 19, 2017. The young Palestinian women don baseball caps on top of their Islamic headscarves and field tennis balls with fabric gloves, giving a decidedly local feel to the great American pastime. They are trying to bring baseball to the Gaza Strip, an effort that is still in its early innings. The players, who work out on a small soccer pitch in a southern Gaza town, admit they are still trying to understand the rules of the complicated sport. With pitches lobbed underhand, the game they play is closer to softball. "I only know it through TV," said Valentina Shaer, a 23-year-old English literature student. Mahmoud Tafesh, the team's coach, said he has dreamed of bringing baseball to Gaza since he was introduced to the game last year. Palestinian women practice with tennis balls while training for an all-women's baseball game on a soccer field in Khan Younis, southern Gaza Strip, March 19, 2017. Although baseball is a fringe sport throughout the soccer-crazy Middle East, the game has grown in popularity. Iraq has a national team, and one of the country's coaches introduced Tafesh to baseball last year while both were in Egypt, which now boasts a baseball and softball federation. Tafesh admits he still has much to learn. He is unfamiliar with any of the teams or players in Major League Baseball and gets most of his knowledge from YouTube videos. When he returned to Gaza, he was concerned about the lack of equipment and whether the conservative society, which is governed by the Islamic militant group Hamas, would accept the idea of girls playing the sport. He first approached girls at the only sports education college in Gaza. To his surprise, he found interest in baseball was stronger among girls than boys. "We targeted this group because they had permission from their families to play sport as sports students. Through them, we started to spread, attracting girls from other fields such as journalism and accountants," he said after finishing a two-hour training session for the girls. The women say their families had no objection, and some parents even encouraged them. But the society overall has not been as receptive. Shaer said people "on social media had a bad idea about us," noting abusive comments when their pictures first appeared. On Sunday, the team, which includes 20 to 30 members, had its weekly practice on a soccer pitch in the female section of Al-Aqsa University, built on lands that were part of Jewish settlements before Israel withdrew its troops and settlers from Gaza in 2005. A Palestinian woman choses equipment before starting to train for an all-women's baseball game on a soccer field in Khan Younis, southern Gaza Strip, March 19, 2017. There were no males except for the coach, and some other students gathered to watch the women playing catch and taking batting practice. The batters took wild swings, often missing but occasionally making solid contact. The players wore headscarves as well as long-sleeve running tops and loose pants, in keeping with local norms. "While we face difficulties, we would like a specialized softball field to learn it correctly and train freely without any obstacles," said Iman Shahin, an athlete who studies sports education. Israel and Egypt imposed a blockade on Gaza after Hamas seized power in 2007, heavily restricting travel and trade, and making it difficult to acquire specialized sports equipment. 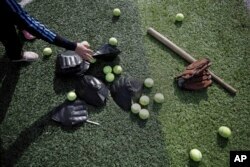 Tafesh said he found just one baseball glove in all of Gaza, at the Sports Ministry building, and took it to local tailors who used it to make replicas out of black fabric. With no proper bats in the territory, the team took a piece of wood and shaped it to look like one. While seeking funding and real equipment, the women dream of eventually competing abroad. "All of us share the same goal: participate and represent the name of Palestine outside and show that there are sports for the girls in Gaza," said 24-year-old Iman Mughaier.